Many thanks to Erin Pringle who asked me to write this piece for her 2015 Summer Library Series. 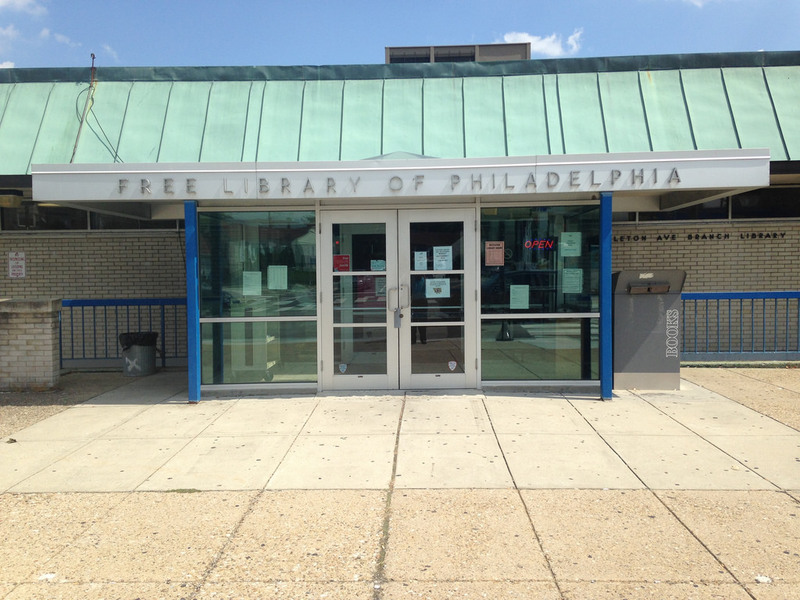 The Bustleton branch of the Free Library of Philadelphia looks like a highway rest stop: a single-story structure with long, narrow windows and a corrugated green roof. It’s located next to Washington High school, which was an easy walk from our house in Northeast Philadelphia. My mother claims that she took out fifteen books a week for me. I never came along which made the process more efficient, but could be the reason why I have no early memories of libraries, no sentimental images of choosing my own read-out-loud book and watching a librarian stamp it with the due-date. It also may explain why I couldn’t grasp that these library books were shared property. 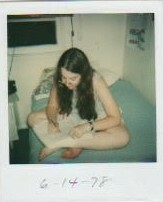 I’d dog-ear pages, crack spines, and stain whatever I was reading with whatever I was eating at the time. You might say that I left my mark. Me and my “hippie sister” in matching dark-green dresses. Things got worse when I began to check out books on my own. I didn’t return them. Cheap paperbacks like Paul Zindel’s The Pigman migrated from the library’s wire racks to my bookshelf and stayed there, along with dozens of case studies about teenagers who drifted through a hostile world until they finally found the person who understood them. I was that person. No one could love those books like me. Returning them to the library felt just plain wrong, as though I was condemning Lisa Bright and Dark or Dibs in Search of Self to a life of abandonment and alienation. 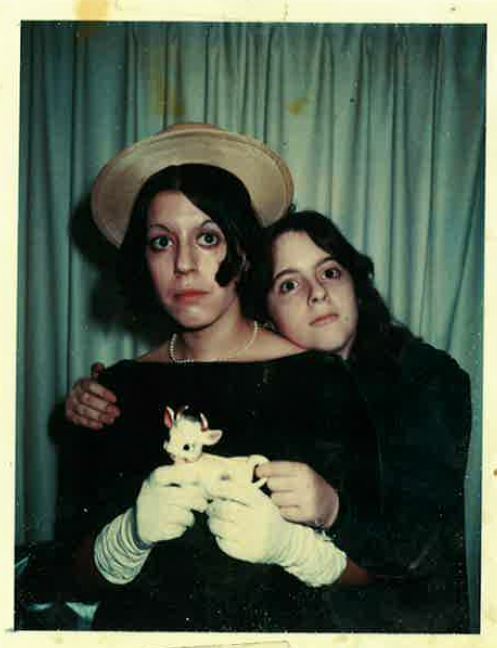 Besides, my older sister—a hippie and a role model— had so many library fines accrued that she was actually forbidden from ever taking out a book again, and I had to do everything she did. In short—though I wouldn’t have used those words when I was twelve—returning library books felt like giving in to a conformist culture. What was the turning point? In 1977, when I was fourteen, I actually wanted a book that was in demand, Alex Hailey’s Roots. Did the library have a record of all those unreturned paperbacks? Maybe not, because they put me on a waiting list, and when my turn came, I took home a thick hardback with the same bold cover that had appeared at the end of the opening credits of the miniseries, and I propped it on my nightstand so it would be the first thing I’d see when I got up in the morning. Actually, the book wasn’t nearly as good as I thought it would be, but I did return it on time. After all, someone had done the same for me. My father took this picture. I think I’m writing, probably not in a library book. Maybe that’s when I realized that libraries demanded a kind of social contract. Who read my nerdy paperbacks before I came along? I looked at the call slips and saw the long strip of stamped months and dates. Eight readers had checked out I Never Promised You a Rose Garden. They were decent enough to return it so I could get my chance to read about a schizophrenic teenager and her German therapist. It’s romantic to imagine you’re the only one who loves something. It’s astounding to realize that you’re not alone. Who were the readers represented by the back-and-front eternity of stamps on Prince Caspian or Player Piano? Who took out Le Guin’s The Dispossessed or Kropotkin’s Mutual Aid or just about anything by Orwell or the autobiography of Emma Goldman? In the days before social media, it wasn’t easy to find these people, my people, my tribe, but the stamped cards were proof positive: That tribe existed. It took me a long time to understand that honoring the social contract of a library isn’t conformist. It’s counter-cultural. In a consumer society, libraries aren’t about what we own; they’re about what we share. Given this understanding, when I look through my own crammed bookshelves, what should I do when I come across a copy of Then Again, Maybe I Won’t that was due on March 12, 1973? Should I return it? Probably. I had to respond to this. When I took out Books from the Libraary for you, they were alwys returned on time or renewed! if you wanted me to read any of them again for you. you could not yet read by yourself. By the time you could read yourself and were able to go to the Library yourself, if a Book was overddue you could be sure I had you return it if I was aware of it. I bought many books for you at Flea Markets and you had many at Home from your siblings….I was not at that time able to buy them at Book stores. I later passed them on to your Nieces and Nephews and kept a Children’s Library at home and wheever the Grandchildren visited they went straight to MY Children’s Library and until they could read by themselves we spent much time with Dad and I reading to them. We have always been a READING Family! I know Dayle had a problem about returning Books to the Library, but I was not aware of this about you. I should have been MORE vigilant. Dayle was in her teens when I became aware of it and did the best I could with seeing that those I knew about were returned to the Library! doing a better job of keeping tabs on those that were NOT returned! Please, next time you do an article like the one you did……very well written………check the facts with me. The only thing you asked was if I took you to the Libraryn you were little.. The answer wa Honest…..not before you could read! For the record, my mother is in NO way responsible for any problems I had returning books to the library. In fact, I’m sure that if she attempted to return my books for me– once I was 13 or so– I would have resisted (I was that kind of teenager). Much of the time, she was simply unaware of my attitude towards returning books which did change over time. Therefore, I stand by what I wrote. Sorry, mom. Some of those Bookss you owned were purchased by me at Flea Markets for $1..00 each or Less. That is how we got such a Large Private Library for my Grandchildren to run to whenever they visited. They have all been passed on to other Young Children e.g. Declan.when I moved! When you were Young enough and did not yet read, they did not have Story Time at Libraries and there were very few very Young childdren to be seen in Libraries as there are today. It was a VERY different time!